Big on beauty and low on maintenance, this lovely basket is a sure way to make anyone smile. 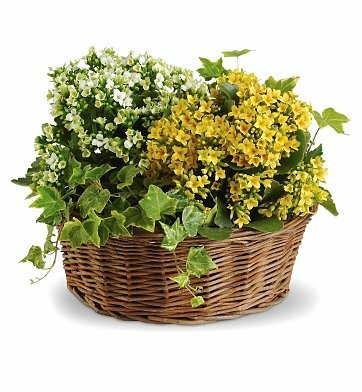 Charming ivy and kalanchoe are hand-arranged in a wicker basket for a "fresh from the garden" look. Sweet and long-lasting, this freshly arranged basket of living plants will provide months and even years of enjoyment when properly cared for, making it a great gift with lasting appeal. Measures approximately 13" x 11". Basket of Joy is a hand delivered gift. These gifts are delivered by one of our local design centers located throughout the United States and Canada. Same day delivery is available for most gifts when ordered before the cutoff time. The cutoff time for Basket of Joy is 2 PM in the recipient's time zone. The gift was fabulous and was delivered promptly. Great service!! !